Steyning Arts: Finding the perfect gift - Some Xmas inspiration. You know that feeling when you’ve found the perfect gift? Something that’s just right for the person; charming; original; and yet doesn’t break the bank. But where do you go to find these elusive items? 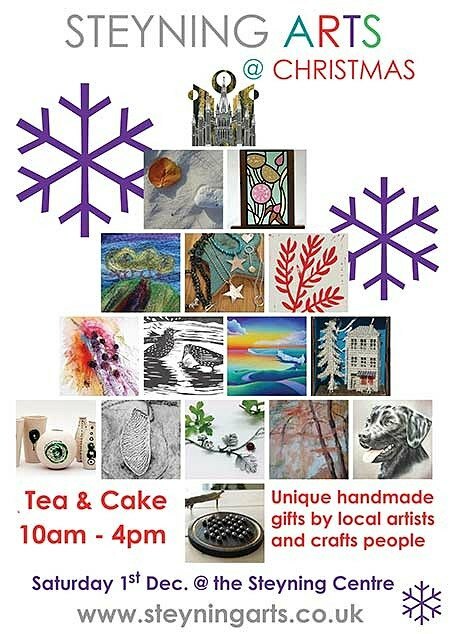 The Steyning Arts at Christmas fair is a great place to start. Work from 26 local artists will be on sale. There will be beautiful handmade cards and delicate ceramic bowls and vases, alongside delightful stained glass ornaments and other Xmas tree decorations. Or perhaps you’ll be tempted by some of the unique hand-crafted jewellery on offer, or an original painting or print. There will also be exquisite paper-cuts and textile work to choose from, fine walking sticks, and more. So why not take the pain out of Xmas shopping and come along and see what gems you can discover. Steyning Arts at Christmas is the antidote to the High Street crowds and the Amazon jungle. You could even cheat and buy something for yourself! The fair is open from 10:00 to 16:00, with parking available right outside. There will be tea and cakes on sale in aid of Steyning Area First Responders (SAFeR), who will also be running life saving demonstrations during the day. So as well as picking up the perfect gift you can enjoy a yummy piece of cake and learn how to save a life!